Several versions of Harry Potter and the Chamber of Secrets have been released in the past - DVD, Blu-ray, extended version - but none so much detailed and brilliant as the 4K UHD version. J.K. Rowling came up with a brilliant idea- a boy who is a wizard and gets into a load of scrapes with his friends. The story continues in the second book and therefore, the second movie, courtesy of - or should we say luckily enough- provided by Warner Bros. Studios. Harry Potter is a mix of fantasy and adventure and mystery all thrown together while watching our favorite trio grow together. Harry Potter and The Chamber of Secrets brings the Harry Potter movie a much-anticipated sequel. No one could have known the explosion that this franchise would create for a generation of inquiring minds and adults alike. Harry Potter is simply not a book series - it is not simply a movie franchise - but between author JK Rowling and her collaboration and choosing Warner Bros. Studio to bring the Wizarding World of Harry Potter alive- they created a culture that will ride out the history of time. In this second installment of the franchise, we see Harry (Daniel Radcliffe; The Woman in Black) spending his summer at home with the Dursleys. After the family keeps his mail from him and locks him away, he is rescued by the Weasleys and eventually they head off to Hogwarts. Harry soon finds himself in trouble yet again and must work with his friends to save the world. This time, besides the introduction of the awesome flying car and Dobby (voiced by Toby Jones; The Hunger Games: Catching Fire) the house elf, we learn that the dark forces have opened something called The Chamber of Secrets (hence the title). This chamber was constructed by Salazar Slytherin and is said to be home to a monster that only a Slytherin heir can control. When Harry communicates with a snake he is deemed to be the heir but we learn in later movies that he is not and there is a darker reason why he can speak to snakes. Meanwhile, The monster known as a basilisk (a giant serpent), kills its prey with direct eye contact but when several students wind up petrified it is revealed they only indirectly saw the creature's eyes. When Harry enters the chamber he sees an unconscious Ginny (Bonnie Wright; Before Sleep) with Tom Riddle (Christian Coulson; The Hours) who reveals he is really Lord Voldemort. Harry kills the Basilisk and destroys Tom Riddle's Diary that was used to open the chamber originally, once again saving the day. 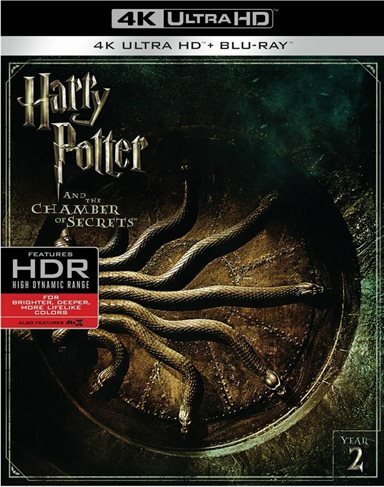 Several versions of Harry Potter and the Chamber of Secrets have been released in the past - DVD, Blu-ray, and an extended version- but none so much detailed and brilliant as the 4K UHD version. While the bonus features remain the same as the prior Blu-ray release, the picture quality and movie have been upgraded enough to look fabulous in order to ensure a freckle on Hermione's face or a glimmer in Professor Dumbledore's eyes. Blacks are spot on and consistent and the color palette really pops with the addition of UHD. Colors are crisper than in the Blu-ray version. House colors pop just that much more and the continuous green gown of Professor McGonagall pops against the deep black of her witch's hat and Snape's very black hair and robes. The red and yellow of the Phoenix against the deep greys of the dungeon in the final scenes are completely contradictory, demonstrating the dark attitude of Voldemort in contrast with the rebirth of good magic. The 4K UHD version presents the video in 2160p with an aspect ratio of 2.40:1. The 4K UHD version has clarity and detail that is not quite as sharp in the previous releases. Forest details pop, Hagrid's hut pops, the fight with the Basilisk in the downstairs "dungeon" is clear as day, even though the scene is a darker scene in both lighting and perception. Introducing Dobby in this film and providing the benefits of seeing just how big his eyes and ears are, and how dirty his robe is - that makes a huge difference is how Dobby is perceived as a house elf. There is a higher grade of detail presented in the 4K version - enough differences to make sure one needs to own this latest version of this movie. Audio is present in DTS: X. The background music - so unique, pivotal, and defining - is clear and sharp. Never overpowering the dialogue, the music has always foreshadowed the emotions exhibited and felt by the characters. It was nice to hear the melodic temperament on a deeper level than previously presented. Creating the World of Harry Potter, Part 2: Characters: In this segment, we learn more about the characters in the series of films with Producer David Heyman providing commentary. We also get to see some outtakes. The Chamber of Secrets Revealed: This segment includes some behind the scenes footage as well as production information. Screen Tests: This segment includes some early screen tests for Daniel Radcliffe, Emma Watson, and Rupert Grint. Deleted Scenes: Deletd scenes that include "Floating Cake," "Borgin & Burkes," "Exiting to Knockturn Alley," "Flying Car Over London," "Harry Finds Kwikspell Letter," "Harry Meets Colin Creevey," "Dark Arts Exam," "Rogue Bludger," "Harry Meets Justin Finch-Fletchley," "Harry Overhears Students," "Harry Sits with Hedwig," "Harry Runs into Hagrid," "Ron and Hermione Question Harry," "Polyjuice Preparation," "Crabbe & Goyle," "Ron Remembers Tom Riddle," "Harry Tells Ron About Hagrid," "Harry and Ron Use Invisibility Cloak," and "Finding Flying Car in Forbidden Forest." Trailers and TV Spots: A teaser, a theatrical trailer and some television spots for the film. While one may usually look for the extras to sway their decision to buy the latest home theater release of their favorite film, the purchase of this 4K UHD is justified solely on the fact that the picture and audio quality miles better than prior releases. You will not be disappointed. Download Harry Potter and the Chamber of Secrets from the iTunes Store in Digial HD. For more information about Harry Potter and the Chamber of Secrets visit the FlickDirect Movie Database.